We have consciously decided to restrict our expansion in terms of number of veterinary surgeons to enable us to give you more continuity of care in service. This does not however mean that we have restricted the services our vets and nurses are able to offer. The practice offers high quality vet facilities that include full diagnostic, imaging and surgical facilities on site and separate kennel areas for dogs and cats. However, all the equipment in the world is of no use unless those using it are suitably skilled. For processing urgent blood and cell samples we have our own laboratory section with blood machines that can measure such things as kidney and liver function and a microscope to examine skin, hair and cell samples. We also have close relationships with several external laboratories which gives us access to specialist pathologists with whom we can discuss cases to get the most out of diagnostic tests. The use of the external labs is often more cost effective to you than in house testing and turnaround time is surprisingly fast so for most routine samples we will send your pets bloods to the specialist external laboratory. The X-ray machine can take high definition radiographs in very short exposure times to maximise the amount of information we can use. The radiographs are then developed on site within minutes using a digital imaging system and can be interpreted and reported to you the same day. 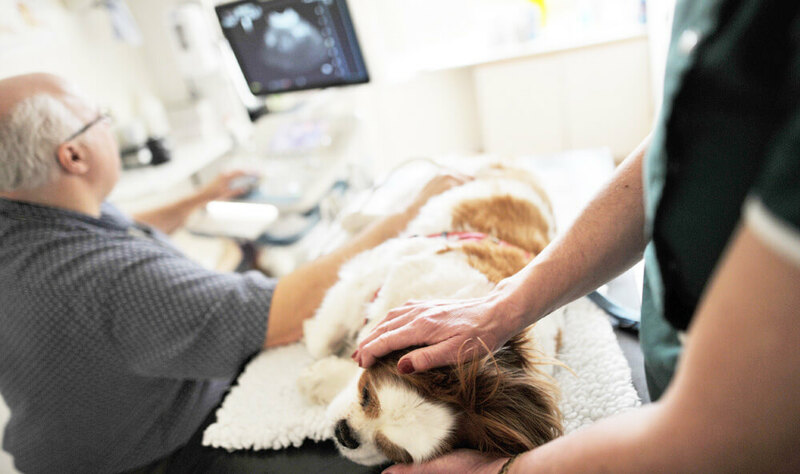 We are fully able to undertake radiographs for the Kennel Club Hip and Elbow Dysplasia schemes for dogs that you may be considering breeding. We have very high level imaging facilities with full on-site digital x-ray and diagnostic ultrasound facilities (these allow us to examine changes in shape, size and structure of the internal organs). We also have a variety of endoscopes for endoscopy (these are cameras that can be used to examine the stomach, nasal cavities or other parts of the body). Our dedicated theatre is used for performing both more commonly performed surgeries such as neutering and also more unusual procedures such as complex fracture repairs. The theatre is equipped with monitoring devices to maximise anaesthetic safety. We have a separate area for performing less sterile procedures such as dental work where our air driven dental unit of the same type as used by your own dentist makes cleaning and polishing your pets teeth a faster and more accurate procedure and allows extractions while minimizing postoperative discomfort.